The U.S. labor market seems to have finally healed. The unemployment rate has been below 5 percent for some time and job growth is steady. And more Americans are coming back to the labor market—in other words, labor participation is increasing. Yet, despite a bump-up in 2015, wage growth so far this year—compared to the 2000s—is still disappointingly low (see Chart 1). This is worrying because consumer spending, which makes up the majority of U.S. economic output, cannot continue at the current pace unless wages grow. Low wages are a vestige of the crisis. Almost eight years after the height of the crisis, laid-off workers continue to re-enter the labor force, which affects average wage growth. This so-called decomposition effect occurs when new employees are hired for less than the average wage rate. When a worker finds a new job after a long unemployment spell, his or her wages tend to be well below that of peers who remained employed. As a result, these new hires bring down the average hourly wage rate—that is, the rate across all workers. In a recently published study, I find that this re-entry effect is substantially larger in the post-Great Recession period than before, as returnees to the labor market have to accept large wage cuts. The next question is whether wages among steadily employed workers are growing at a healthy clip. The results are not so surprising: wage growth for a broad segment of workers is also lower than a decade ago. For instance, wages of so-called job stayers—the vast majority of U.S. workers who remain at the same job—have risen 3.5 percent this year, a full percentage point lower than before the Great Recession. Similarly, earnings in the middle of the wage distribution—the 50th percentile—are also seeing less gains than in the past: they have risen by 3.2 this year compared to 4.1 percent during 2000–07. The same is true for workers in services and other sectors. 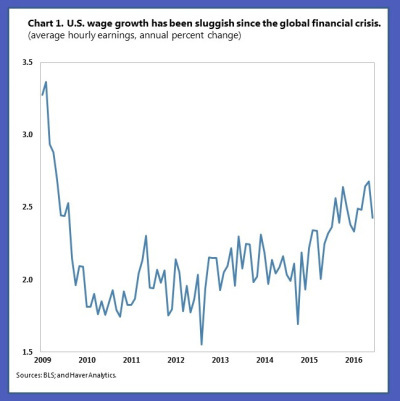 And while it is often said that slow wage growth is due to a rising share of low-paying jobs, the data do not support it: the number of low-wage jobs has grown but not nearly fast enough to make a substantial dent in average wage growth. A likely reason for slow wage growth is declining productivity of workers. The more productive workers are, the more they earn. New research shows that labor mobility—the grease that has oiled the U.S. productivity machinery—has slowed. For more than two decades, workers have transitioned less and less frequently between firms or across sectors. This decline in labor market fluidity, a term publicized by a 2014 study, has weakened a traditional source of wage growth: the climb up the wage ladder by changing jobs. 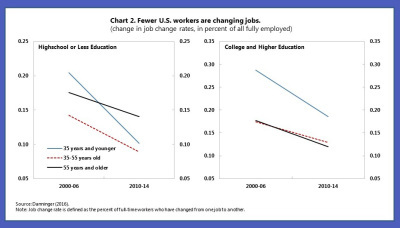 In my study, I show that the decline in job changing was substantial—from 20 percent of job changes per year on average in the early 2000s to 12 percent in the last few years. And the decline was widespread: job move rates fell among young as well as older workers, the skilled and low-skilled, and women and men (see Chart 2). These results hold after accounting for lower job security post-2008 and changes in the age and skill composition of the U.S. labor market. In other words, labor reallocates less than in the past. But are less frequent job changes a bad thing? Maybe, but unlikely. There is little evidence that job searching has become easier and job matching better. Rather, reallocation rates of workers to more productive firms appear to have slowed. Possible reasons are a rise in regulations that have raised the cost of job changing and hiring, technological change that makes skills less transferable, or a rise in social distrust. So, the case of a resounding wage recovery being just around the corner is not a strong one. For this reason, policies that help raise wages by increasing productivity are paramount. In the United States there is a strong policy case for increasing infrastructure investment to help businesses become more productive, but also a need to expand partnerships between industry and higher education institutions, more vocational training, and apprenticeship programs.